When it comes to finding photo opportunities in Australia, new lists could be created every day, probably every minute, as there is so much to see in such a huge continent. Same goes for Melbourne, a metropolis home to famous buildings, museums, outdoor areas, and iconic views. We decided to put down a slightly different post from your usual “things to see in Melbourne”, adding some local and less known places to the usual spots. On the same note, we’ve teamed up with Tigerair to give you the chance to win a $250 flight voucher participating in their #GoLikeALocal giveaway. Scroll to the bottom to know more. Tigerair links Australia’s main destinations with cheap flights daily, have a look at their website to be inspired. They have flights to all the destinations we’ve been to in Australia so far, including Cairns, Brisbane and Sydney. But let’s now focus on our personal top 7 Instagram spots in Melbourne. TIP: For the strong hearted, try the Edge Experience, the world’s only moving glass structure, and feel the thrill of being suspended above the void. We mentioned Eureka Tower for night views of the city, however the best spot where to appreciate Melbourne’s skyline is The Boulevard (aka The Blvd). Drive here during or after sunset to see the lights turning on and painting the night. TIP: don’t forget to bring your tripod to get a steady shot with long exposure. CAUTION: very romantic spot, you will likely be surrounded by couples in love. Don’t be shy and hold position! Did you know it is possible to spot wild kangaroos within the city of Melbourne, without paying any admission ticket? Now you know! A dear friend brought us to his local golf club and there they were, dozens of kangaroos having a feast at the well kept golf course lawn. If you have been living for a while in Australia like us, you should already know kangaroos and wallabies love to come out at sunset and chill at golf clubs, where they can roam undisturbed all night. They are used to humans and are quite approachable, some even dare to stand in the way of drive shots! Clearly, any golf club should do the job, we listed the place where we got to see them closely, but there’s plenty of areas in and around the city. We were at Albert Park for our first time during the F1 Grand Prix and fell in love with the view of the city skyline above the lake, where we took the pic below. The huge park develops around the central lake and includes several sports complexes as an aquatic centre, a sailing club and a football club. TIP: If you plan to visit Melbourne in March, have a look at the F1 calendar, as you might be in for one of the most exciting events of the year in the sports capital of Australia. You probably have already heard about or seen pictures of popular Hozier Lane, where artistic murals cover every inch of the walls. But in our opinion AC/DC Lane offers a more rewarding experience due to the lack of tourists. This also means you won’t have to fight with other people to get your photos. It’s easy to combine both lanes, and a few others, on a short walking itinerary in the CBD of Melbourne, so do yourself a favour and don’t stick to Hozier Lane only! One of the classic views of Melbourne, and also one of the easiest to reach. Hop off a train or tram in the central Flinders Street Station and get a selfie in front of the Yarra River. The always changing city skyline will be the background of your shot! TIP: come here in the early morning to anticipate commuters getting to their offices and to take advantage of the best sunlight. Head to the beachside neighbourhood of St Kilda to catch some sea breeze and cool down. The Coney Island inspired Luna Park will steal the scene by night, with its thousands of lights, sounds and colours. Getting your Insta shot at the front gate is a must! TIP: For those of you who will visit Sydney other than Melbourne during their Australian trip, try and take the same shot at both Luna Parks, like we did! Terms and conditions: the winner will receive one $250 Tigerair voucher. Please note: This competition is open to Australian residents aged 18+ only. The competition starts on 1st April 2019 and closes on 7th April 2019. 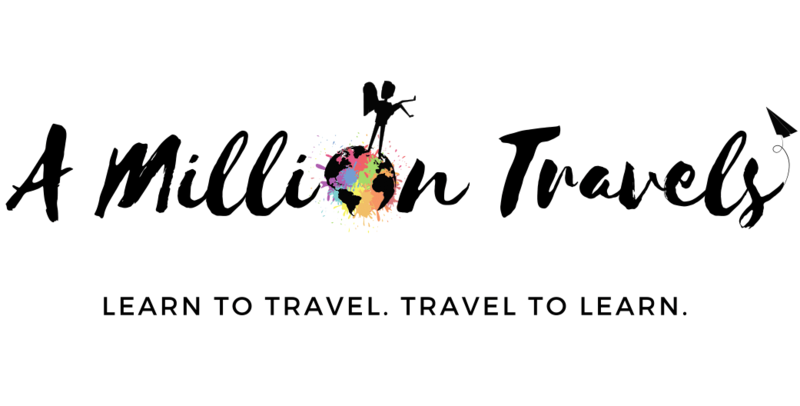 The winner will be announced on A Million Travels Instagram story 8th April 2019. Should the initial winner not respond within 7 days of the announcement, a second winner will be chosen. The prize will be delivered by Tigerair. So this was our 7 favourite Instagram spots in Melbourne. Did we miss any famous one? What’s your favourite spot? Let us know in the comments below! Thanks for the tips!! Will come handy when I get to Melbourne. So far my favourite place has been Kuranda, a little gem in the rainforest close to Cairns! Oh such sweet memories to us! We lived in Cairns for a few weeks and loved going to Kuranda! These are great photo locations and you’ve certainly inspired some truly magical shots. We’ll be sure to check them out on our next visit! Thank you for your very nice words. We are totally in love with Melbourne too! Done all but n.3, now I know where to look for kangaroos in Melbourne, thanks ! I loved the quiet towns of 1770 and Agnes Water when I was in Queensland last time, very local and relaxing..
Good on you! Agnes Water is where we tried surfing for our very first time!